Welcome to the Leicestershire Scouts Water Activities group. We run and co-ordinate exciting water based activities and events for scouting in Leicestershire. Simply use the menu bar at the top of the page to navigate to an activity and find out more information, availability dates (where applicable) and to use our enquiry form. 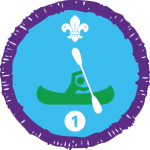 You may not know, but Splash Camp counts towards 2 sessions for the new "Time on the Water" staged activity badge. Brilliant!